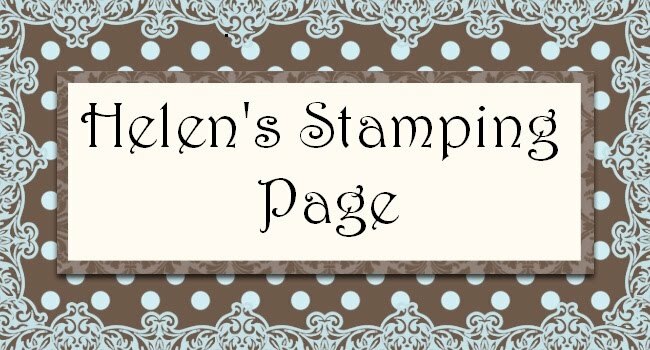 I have made this cards for a Splitcoast Stampers colour challenge and thought I would share my card with you. Accessories - Matt Pack, paper piercer, Stampin' Dimensionals, snail adhesive, buttons bouquet pink and a Stampin Majig. Take the Pink Pirouette base card and stamp the leaf from the Great Friend stamp set and stamp the image repeatedly in Pink Pirouette ink to cover the card. Adhere the Walk In The Park D/S 9cm x 13.5cm D/S paper the the 10cm x 14cm Chocolate Chip card adhere this to the Pink Pirouette base card. Using the Matt pack and paper piercer, pierce holes in the 7cm x 7cm Pink pirouette card using the Matt Pack template as a guide, adhere this to the 7.5cm x 7.5cm Chocolate Chip card. Now adhere this to the card as shown. Ink the butterfly from the Great Friend stamp set in Kiwi Kiss and stamp the butterfly 3 times on Whisper White C/S remember to ink up each time before you stamp. 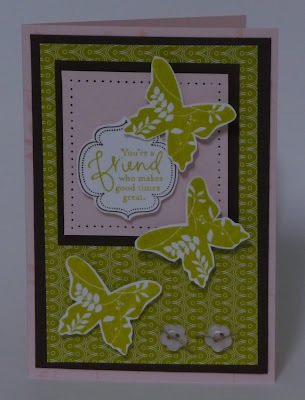 Cut out the butterflies and adhere stampin' dimensionals to the back of each set aside. Stamp the frame in Chocolate Chip ink then using the Stampin' Majig position the words in the center of the frame in Kiwi Kiss ink. Cut out the frame, adhere a dimensionals to the back of the frame and adhere to the 7cm x 7cm Pink pirouette card now adhere the butterflies as shown in the photo. Take 2 of the pink flower buttons and thread the lined tread through and tie a knot to secure. Adhere the buttons to the card using the mini glue dots.